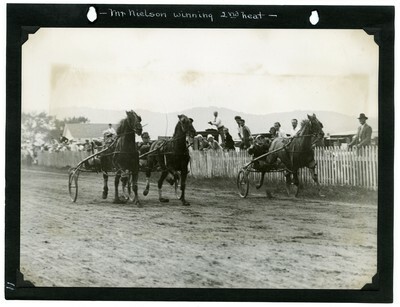 Black and white action photo of the horse, Mr. Neilson winning the second heat of the 2.16 Class Trot or Pace of the Cornish Agricultural Association races at Cornish Fairgrounds & Trotting Park on August 13, 1931. Frank Q. finished second and Expressive Guy showed in third. Expressive Guy went on to claim the $250 purse in a run-off against Mr. Neilson.